I went on a drawing course taught by Emily Haworth Booth at The Prince’s Drawing School in Shoreditch and made this four-page comic (click on the thumbnails or the slideshow below – best viewed fullscreen). When I was at art school in the late 90s, there was a tacit trend of leaving paintings unsigned. I never really got to the bottom of why that was, but I do like the fact that with printmaking there is a clear method for signing work. With a print edition, the usual practice is to mark in pencil just below the bottom-left print edge/plate mark the number of the particular print and the number of prints in the edition (e.g. 5/20 would mean the print was the fifth in an edition of twenty prints). If the print has a title, that goes in the centre. In the right-hand corner goes one’s signature. And, if the year is to be added, that goes afterwards. Extra proofs (generally up to five) can be printed beyond the stated edition and these are signed as artist’s proofs (A/P). In theory, after this, to demonstrate good faith to those who have bought the prints, the plate should be ‘cancelled’ (scored or holes drilled in it) so that it cannot be printed again. 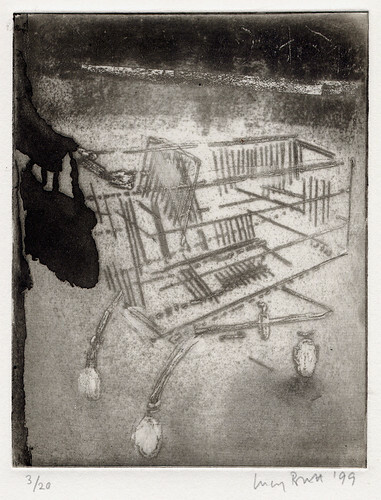 A shopping trolley; graffiti inscribed on a railway bridge; bright cars viewed through a cab window, telegraph wires drawing lines across the sky; figures manoeuvring in the aisles of a supermarket; the patchwork that asphalt, tarmac and markings make on the surface of a road; a petrol station forecourt occupied by a solitary car and driver; a woman unloading her basket at the checkout; commuters staring intently at the train departures board. Underpinning the imagery in my work is the idea that familiar and prosaic events and places are always potentially extraordinary and strange. I am interested in how the litany of the everyday can be transformed into something momentarily sublime. In order to explore this, I make work in a variety of media: charcoal drawings, oil paintings, monoprints and etchings. Within each medium, I have tried to find a formal quality that echoes and expresses my subject matter. The drawings are monotone with torn tissue paper collage and/or marks in oil paint – flashes of colour. Black and white distance the viewer in terms of time whilst the coloured elements jolt the drawing back into the urban present. The paintings are thinly painted, sometimes with areas of canvas or linen left raw, in order to suggest the transitory, fragmentary nature of the moment I am depicting. The etchings combine hard ground graphic lines with soft ground marks and aquatint to convey something of the paradox of the banal: linear and straight, yet able to blur and shift into a different imaginative space. In many of my pieces figures are semi-obscured or moving out of view. There are windows and mirrors, motifs borrowed both from the history of painting and contemporary television and film. I have tried to make the space outside the limits of the support dynamic in the hope that viewers will want to look again at how the city is framed – - how the lines of a heater on the back of a car window intersect with the city outside; or just how fragile people look in the supermarket, aisle after aisle, reaching out for the next item to put in the trolley. 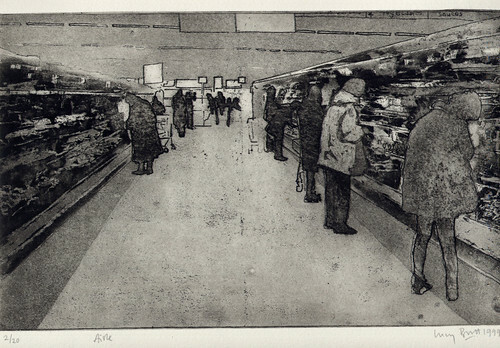 25 x 13cm, Etching and Aquatint, 1999. 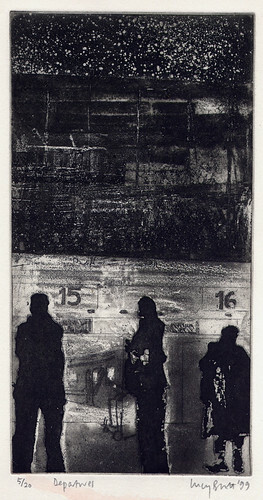 15 x 12cm, Etching and aquatint, 1999. 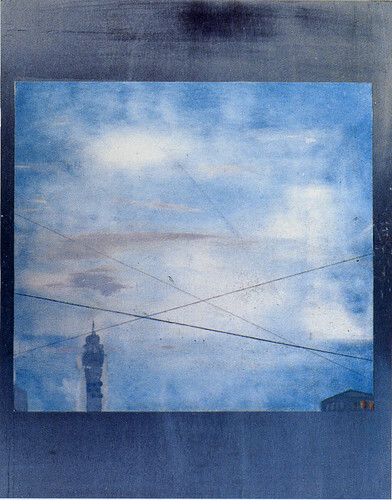 18 x 28cm, Etching and aquatint, 1999. 13 x 12cm, Etching and aquatint, 1999. 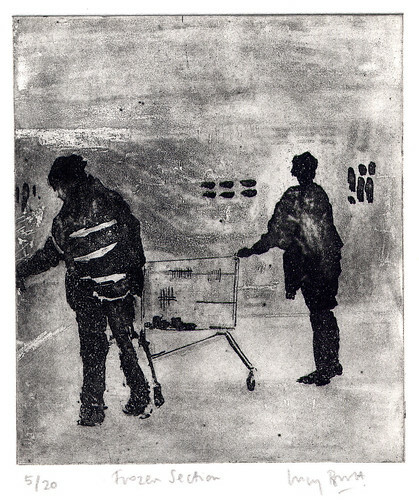 29 x 24cm, Monoprint and etching on paper, mounted on steel, 1999, City and Guilds Institute Collection. 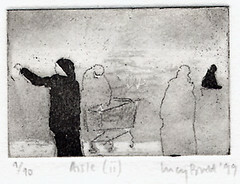 5 x 7.5cm, Etching and aquatint, 1999. 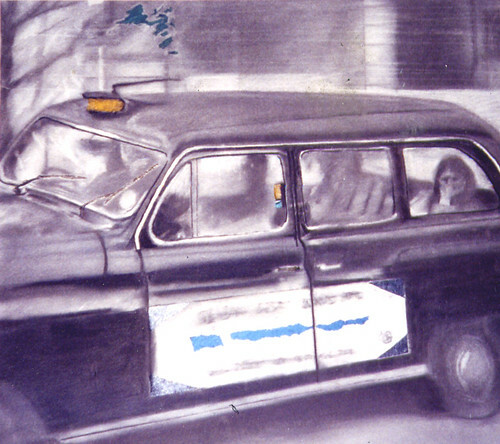 51 x 59cm, Charcoal, oil and collage on paper, 1999.